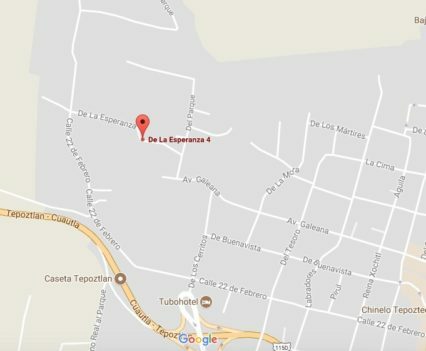 We are located at Calle Esperanza #4, Barrio de San Pedro, Tepoztlán 62520, Morelos. 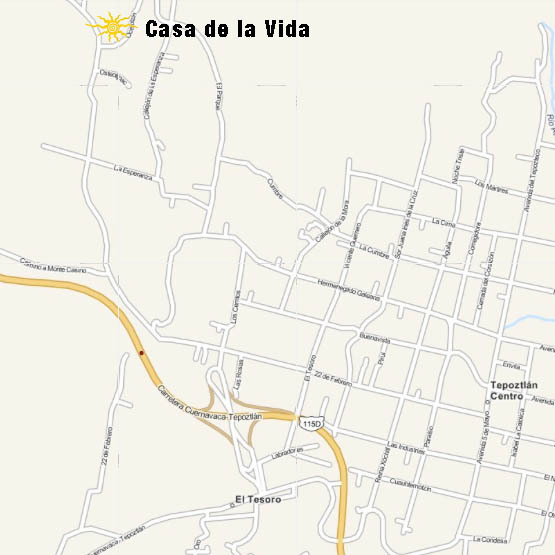 Casa de la Vida, in the town of Tepoztlan, is situated 90 minutes by taxi or bus from Mexico City´s international airport and 25 minutes from Cuernavaca. Tepoztlán, in the state of Morelos, is known as the Pueblo Mágico which has a long tradition of healing and curanderos (healers). Below is a group of maps that will help you reach us. 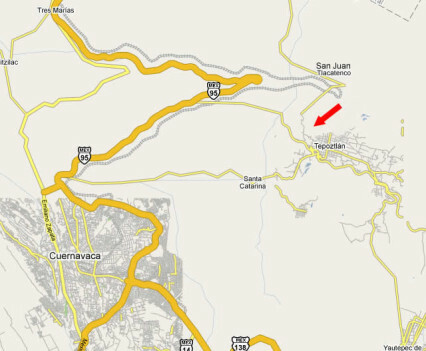 They are in order and go from a large overview of the area down to the road itself that will take you to your destination. 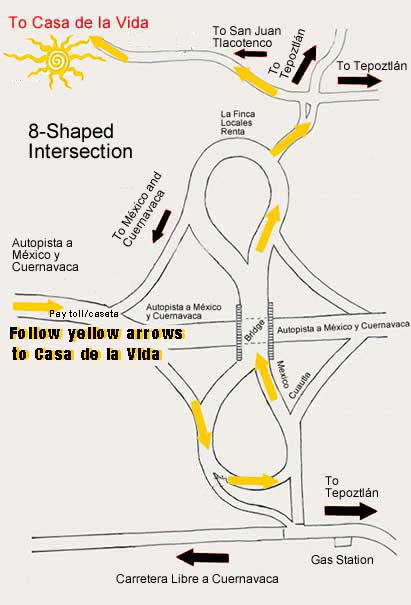 Click here to “Get Directions” for the route to Casa de la Vida. 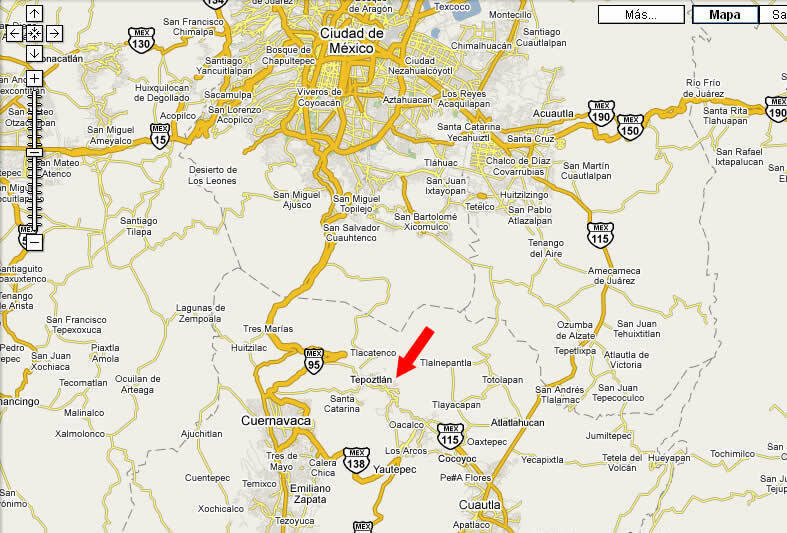 If you are driving from Mexico DF, take the motorway direction Cuernavaca/Tepoztlán. 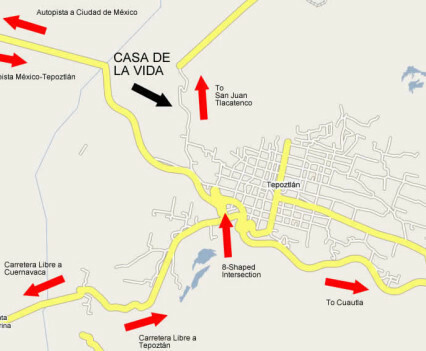 After paying the toll, take the exit for TEPOZTLAN, keeping to your right-hand side. Then follow the road and take the 1st turn to your left. Drive across the yellow bridge (an overpass over the motorway). 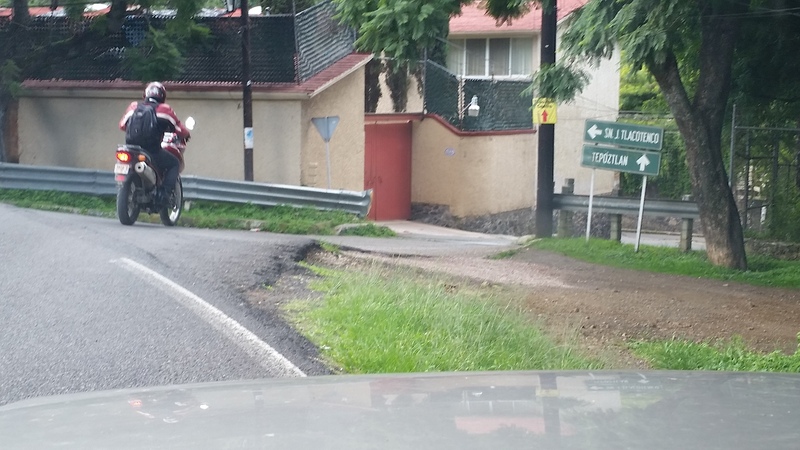 You will see a sign for San Juan Tlacotengo straight ahead of you. Follow it. It may look as if there is no road going down the hill but keep on driving down and the short road becomes a crossroad. Turn LEFT now driving uphill. 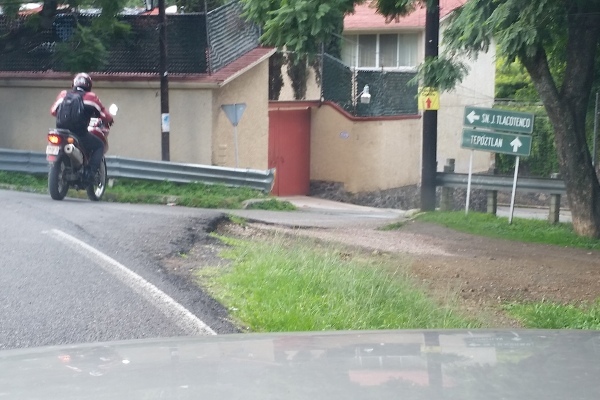 This is the road to San Juan Tlacotengo also called 22 de Febrero. 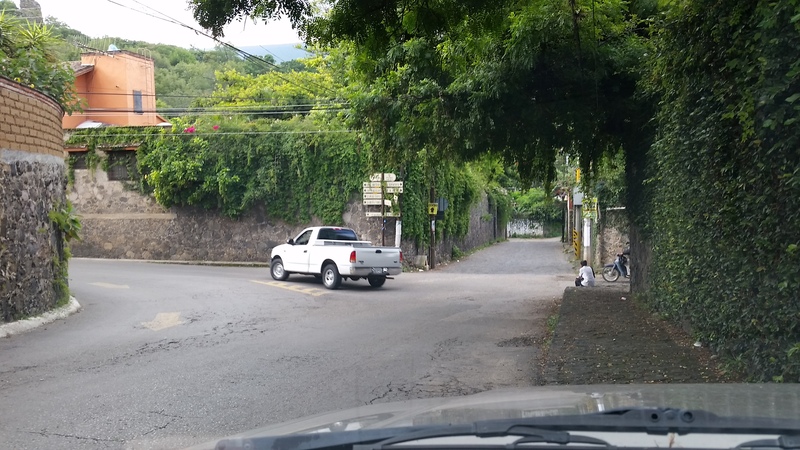 Keep going up this road until you see Calle Esperanza and turn right. 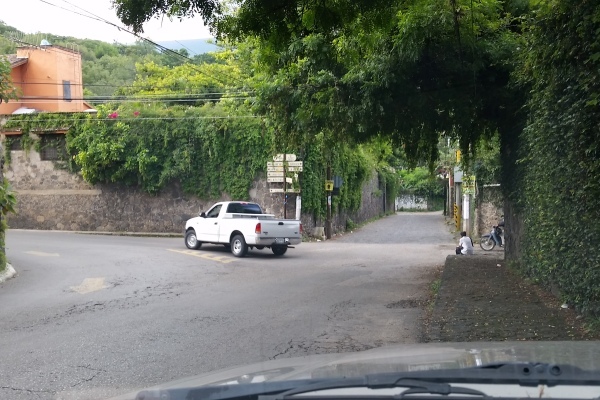 Follow Calle Esperanza as the road slopes downward. You’ll see the large brown gate on the right-hand side. 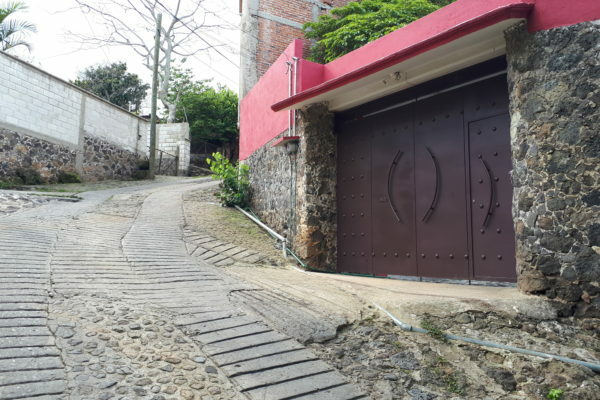 Welcome, you have arrived at Casa de la Vida! 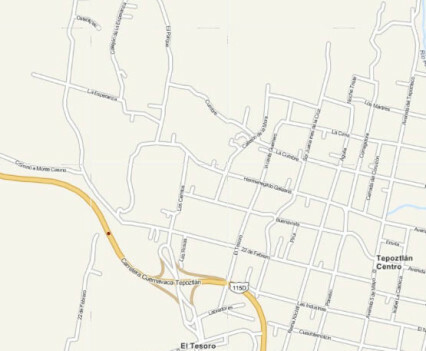 To get to Tepoztlán from the International Airport in Mexico City is safe and easy. 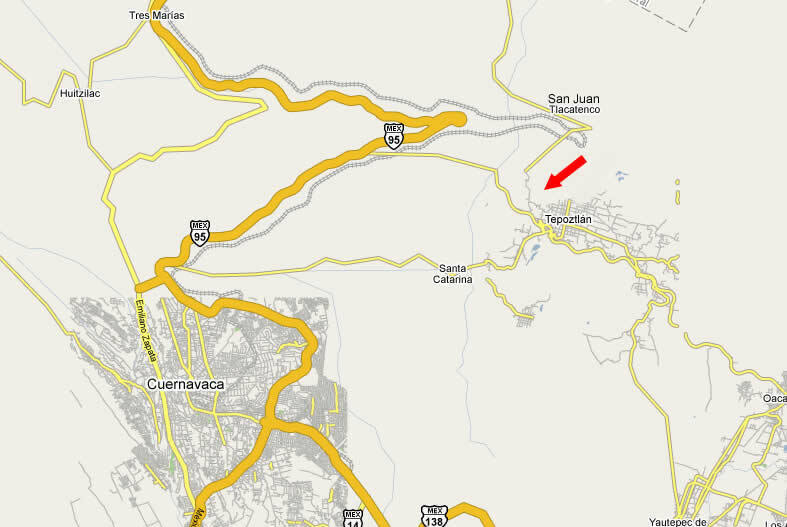 First take a direct bus from the airport to Cuernavaca. Tickets and departing buses are located in Terminal 1. Porters can take you directly to the bus ticket counter and help you with your luggage. 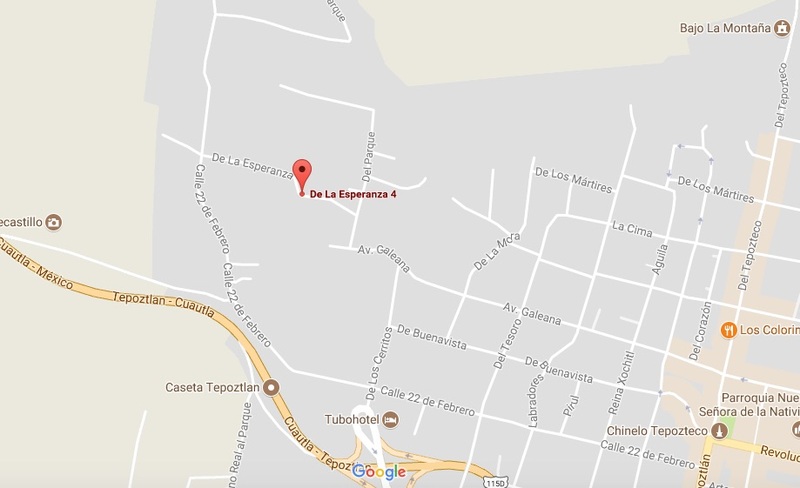 Once you arrive at the Cuernavaca bus station, you will find the taxi stand just outside. 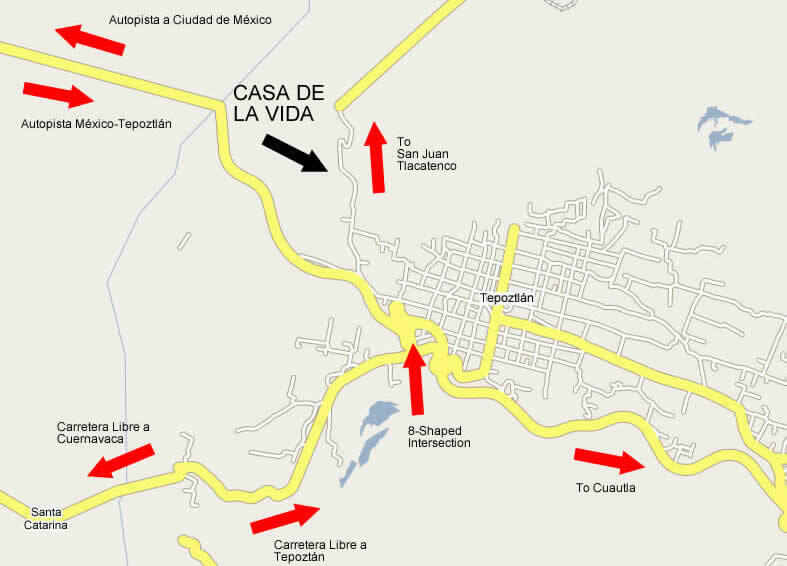 From there take a taxi directly to Tepoztlán and Casa de la Vida (see maps & directions above). The bus ticket from the airport costs $190 MXN and taxi fare from the Cuernavaca bus station to Tepoztlán is approx. $250-300 MXN. The journey by bus takes around 90 mins and the taxi ride about 30 mins. depending on the time of your arrival and the traffic. 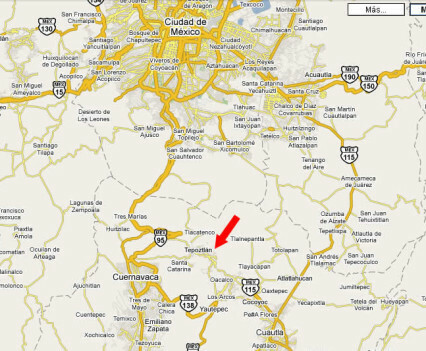 We recommend that you tell the taxi driver to take the motorway (autopista) from Cuernavaca to Tepoztlán. 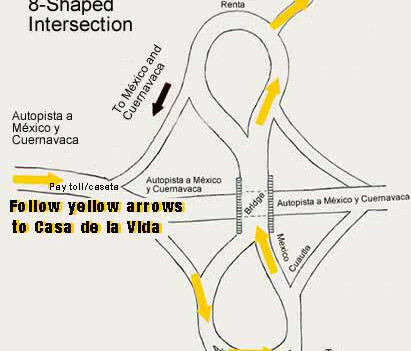 There is an extra charge of $30MXN ($2USD) for the motorway which is faster and more comfortable. 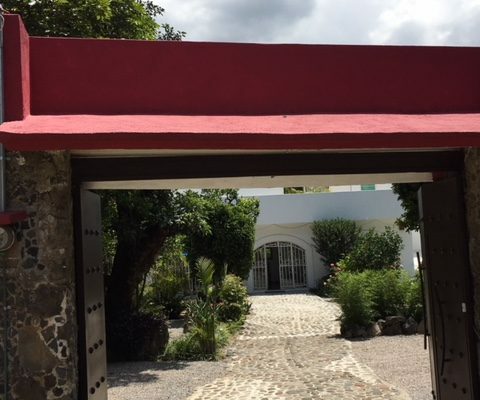 Alternatively, you can take a taxi or the metro from the airport to the Taxqueña bus station (Terminal de Autobuses Central del Sur – Taxqueña), where there are direct departures to Tepoztlán with the Pullman de Morelos bus line. This trip costs between $130 MXN, and takes approximately 1 hour depending on the time of day. The bus service and taxis are safe, efficient, clean and reliable.